Revolutionary War Era Map of Cape Cod and Boston Harbor with dramatic cartouche. A dramatic 1777 Braddock Mead and Le Rouge map of Cape Cod, Nantucket, Martha's Vineyard and Boston Bay. The map covers from Boston to Martha's Vineyard and from Narragansett Bay to Crab Bank and the Nantucket Shoals. This beautiful dissected map is actually the lower right quadrant of the Le Rouge edition of Braddock Mead's Map of the Most Inhabited Part of New England, one of the great Revolutionary War Era maps of the colonial New England. 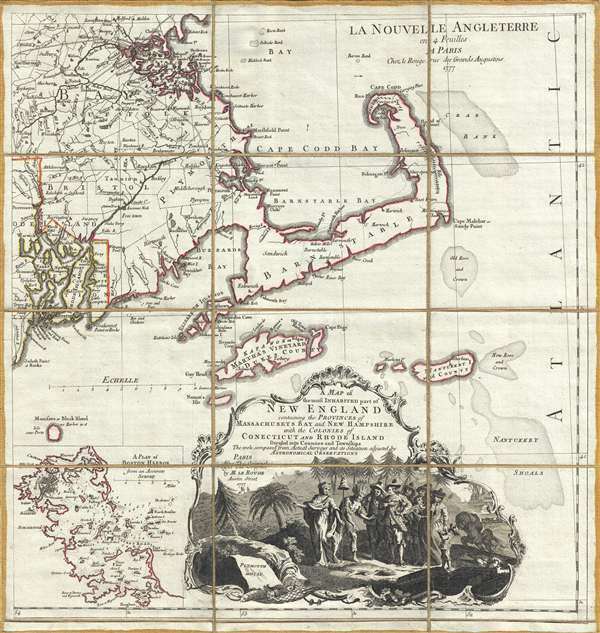 While the full map is enormously proportioned, the present fragment manageably highlights many of the map's most desirable features: the iconic form of Cape Cod, the map's beautifully engraved title cartouche, a wonderful inset of Boston Harbor, and more. Very good. Dissected and mounted on linen.